Frankenstein director James Whale strikes up a friendship with a young gardener. Bill Condon’s poignant and delicate portrait of the twilight days of the director James Whale (Ian McKellan) isn’t the sort of treat you’d expect from the director of such hackwork as FX 2: Murder by Illusion and Candyman: Farewell to the Flesh. Condon’s Oscar-winning film is simply exquisite, apparently perfectly capturing Whale’s character and the late-50s atmosphere. Fans of Universal's classic horror movies will revel in the reminiscences about the making of the Karloff Frankenstein films and Whale’s other classics that are teased out in his conversations with Brendan Fraser's character. Downtown’s UK disc is an essential purchase. The film is presented in 1.85:1 ratio, enhanced for 16:9 presentation. The disc contains an excellent commentary track, which reveals how difficult it was to find financing and distribution for the film, and helps separate the facts about Whale’s life from the parts of the film invented for dramatic purposes. 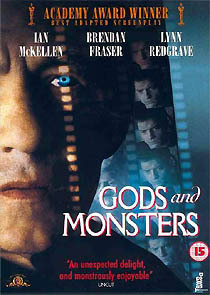 The disc also contains a half-hour documentary, The World of Gods and Monsters: A Journey With James Whale, which details the making of the film, and covers Whale’s life and career. The documentary is narrated by Clive Barker. The UK disc contains an appealing extra that’s not on the US version: a half hour gallery of photo’s and artwork, presented to Carter Burwell’s music from the film. A trailer, production notes and cast and crew profiles complete the package.